It is thought that as many as 80 percent of young blind and visually-impaired children exhibit echolalia in their speech patterns. Echoing is an excellent way to learn and practice language skills, and it is part of language development in most children, blind or sighted. However, in sighted children the period of echolalic speech tends to be relatively short. Blind and visually impaired children, on the other hand, seem to find this behavior more useful, so for them it has a more extended life. The uses of echolalia are many and varied. 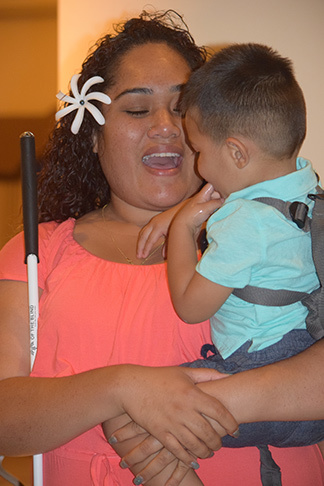 For blind and visually-impaired children it can function in some ways that sight does for other children. Here are some examples. Build a Language Bridge. Language is your child's bridge to the world. His abilities with language will come directly from those around him. Make language work for both of you by providing him with a commentary on his world that grows with his understanding and abilities. The more expressive the language he is exposed to, the greater will be his ability with words—perhaps the most useful tool to give any child. Be sure to explain to your child in very descriptive language what is going on around him. Who is in the room and what are they doing? What are the sounds he is hearing? A nice game to play is "I hear a ..." This game builds on the child's desire to repeat a single phrase, but it also requires her to think and fill in the blank. Sit outside and listen. Have your child tell you what she hears. Help her out by saying, "I hear a motorcycle . . . I hear an airplane . . . I hear the leaves rustling in the breeze." Encourage her to listen and label sounds herself. Simplify your speech. When your child is very young and just beginning to speak, it's a good idea to keep things simple. That way, when he does repeat what you've said, he's actually correct. For example, you may say, "Bye bye, sweetheart," instead of, "Bye bye, Tommy." When he repeats, "Bye bye, sweetheart," his language will actually sound correct. Also, since blind children tend to have a hard time with pronouns, it's a good idea to drop them, at least until your child has mastered other language skills and is ready to move on to pronouns. You may feel a little silly saying things like, "Mummy is going to pick you up now," or, "Tommy sounds tired," but it will help Tommy know who you are talking about without having to decipher all those difficult words like you and me.